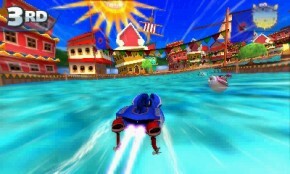 Sonic & All-Stars Racing Transformed for the Xbox 360 is a great game. One of the best kart racers of our generation. Before writing my original review, I basically ended up clearing most of the game over the course of a week: I unlocked every possible racer, finished most of World Tour mode’s missions, and had completed the entire Grand Prix (even mirror tracks). But All-Stars Racing Transformed (ASRT) on the Nintendo 3DS is not that game, and I don’t need to play anywhere near as much of it to communicate one simple fact to you: this is an awful version of a phenomenal game. I actually feel a little bit sheepish for my Xbox 360 review; while I stand by my evaluation and the things I said, at the very end I declare that it’s unfair to compare it to Mario Kart, yet I spend the entirety of the review doing just that. No such pretenses on the 3DS – of the two, Mario Kart 7 is a clear winner, even in spite of ASRT‘s often superior mechanics. Visual fidelity is not this game’s strong suit. All-Stars Racing Transformed tries its darnedest to take its console big brother and squeeze it all down to fit on Nintendo’s handheld. All of the racers, all of the tracks, all of the weapons and most of the modes are present and accounted for. And squeezed is really the applicable term to describe what happened to these things: rather than look like it was made specifically to fit the 3DS, the assets in the game were quite obviously made for HD consoles and then scaled down for the lower powered hardware. Sometimes that works out; the Seasonal Shrines course looks generally passable on the 3DS. 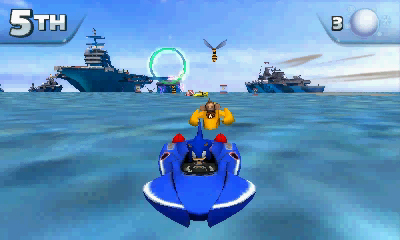 On the other hand, Afterburner’s “Carrier Zone” track looks absolutely abysmal. In general, the game is blurry, flat, and jagged. If that was the worst of the game’s visual problems, that might be passable, but the game suffers from a much larger problem in its framerate. The 3DS struggles to render ASRT – with the handheld becoming noticeably warm to the touch – all for choppy framerates in the teens. If you’re feeling really masochistic, switch on 3D mode and watch the game turn in to a slideshow. The framerate in Rogues Landing got so bad at one point that I honestly became momentarily worried the 3DS had frozen up because it took more than a full second to render the next frame. The only thing more choppy than the game’s framerate are the character animations themselves, which jitter along even in the rare instances where the game itself is running perfectly smooth. It doesn’t stop there. Controls are also a major stumbling block – on multiple occasions I’ve had my boat spin 90 degrees on straightaways for absolutely no reason at all, as if it collided with an invisible object, and the over-steering problems experienced in the Xbox 360 edition of the game are even more pronounced here. The game’s trick system is incredibly finicky; more often than not, I’d fail stunts despite being clear of any obstacles, and I even encountered a few races where the trick system completely broke after using an All-Star move, preventing me from executing any stunts at all for the rest of the race. Failing stunts also causes a frustrating bug to crop up: if you continue to hold down the accelerator after failing a stunt, your vehicle will coast to a complete stop before it’ll begin re-accelerating unless you release the button and re-press it after landing. And then there’s items: with pick-ups so small, you’re probably going to miss grabbing them most of the time. Some items, like the swarm of bees, can actually backfire on you, too – in the HD console versions, you’re largely immune from your own swarm. In ASRT for the 3DS, that’s not always the case. You can plow right through some bees, but touching others will cause you damage. This happened enough that I’m sure it couldn’t have been two separate swarms mixing, either – making the Swarm weapon more of a curse than a blessing for all involved. Samba Studios is one of the more visually impressive tracks. I’ve only spent a little over four hours with ASRT for the 3DS, and I could easily keep going listing the multitude of other problems I’ve noticed – but I think you get the picture. It’s a real shame this version of the game has to be so thoroughly busted, too, because from a features standpoint it is remarkably robust. Not only does it contain all of the tracks from the console version, but it also hooks in to the Nintendo Network to show you your 3DS friends list from inside the game itself, letting you join games already in progress with ease. Online itself works about as well as you could expect – lobbies can hold up to 8 players, and internet latency problems did not seem to be much of an issue. For as broken as the rest of the game is, I was actually surprised to see so many people playing online. Even at 7 A.M. on a Sunday, getting a lobby with 4 or 5 players was a generally painless experience. The game also comes with a built-in online storefront from which you’ll eventually be able buy future downloadable content – but the idea that anyone would actually pay for more of this game in the state it’s currently in is actually sort of offensive to me. I came away from ASRT for the 3DS genuinely shocked. Not since Sonic the Hedgehog Genesis on the Gameboy Advance have I witnessed such a botched port of what is really a legitimately great game. Every now and then you can see bits and pieces of that game shine through – though never enough to ever make a difference. This is, without question, a bad game. Maybe with enough “dedication”, one might become used to its awful, terrible quirks, but that time could instead be spent simply playing better games. Its only hope now is that Sumo Digital returns to the game and issues patches that improve the game’s framerate, controls, and mechanics – but I’m honestly not holding my breath. This game is a waste of money for all involved; not only for the consumer, but for the developer, too. Nobody benefits from a product that is this sloppy and unfinished. If you’re really dying to play Sonic & All-Stars Racing Transformed, any other version of this game is better than what’s on display here.